PRINCETON JUNCTION, N.J. – May 27, 2016 –Creative Marketing Alliance (CMA), a full-service, award-winning marketing firm located in Princeton Junction, helped advance Trenton Digital Initiative’s (TDI) mission at Ancero’s Wine-Tasting Reception on May 26, 2016. 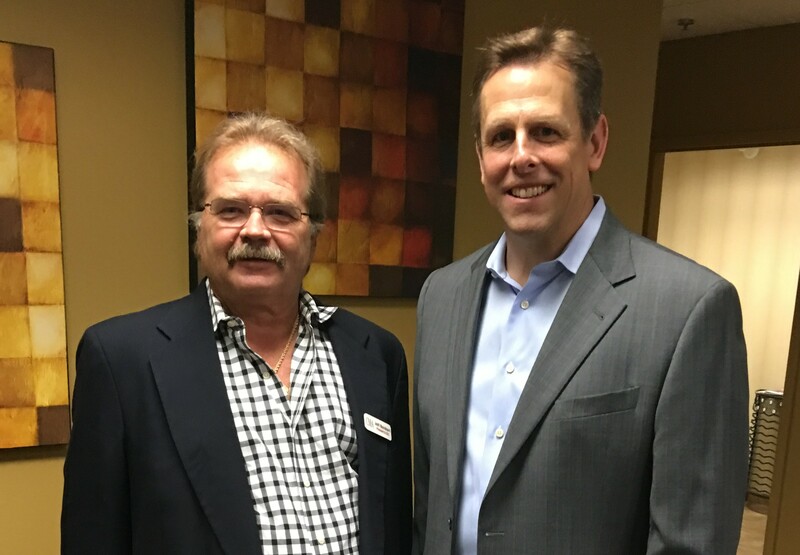 Jeffrey Barnhart, CEO and president of CMA and Robert Hogg, executive director of Ancero at the wine tasting to benefit Trenton Digital Initiative at the IT consulting company’s office in Mount Laurel. During the event, Ancero collected more than 55 computers and pieces of computer-related equipment donations in addition to $1,000 from the more than 180 attendees. “Because everyone deserves Internet access” is the credo of TDI, a non-profit program that works to help economically challenged Trenton families cross the digital divide. The organization estimates there are 10,000 families in Trenton that don’t own a computer. TDI reconditions, repurposes and then distributes donated computers to these families for free. 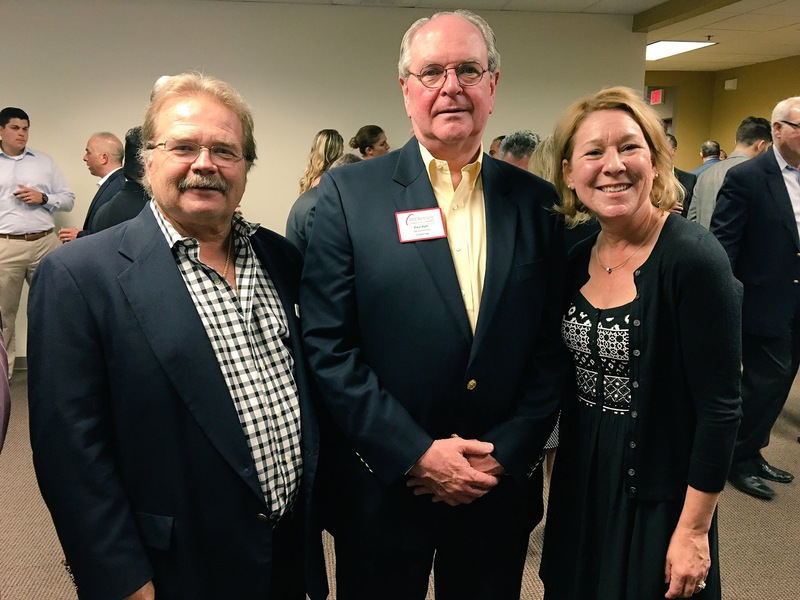 Jeffrey Barnhart, CEO and president of CMA, Paul Kuhl, chair of the MIDJersey Chamber of Commerce and senior manager at withum and Linda Kelly, business development at MIDJersey Chamber are pictured at a wine tasting to benefit Trenton Digital Initiative at Ancero in Mount Laurel. TDI was started in Trenton in 2011 in partnership with Mercer Street Friends, which services underprivileged populations in the Trenton area. 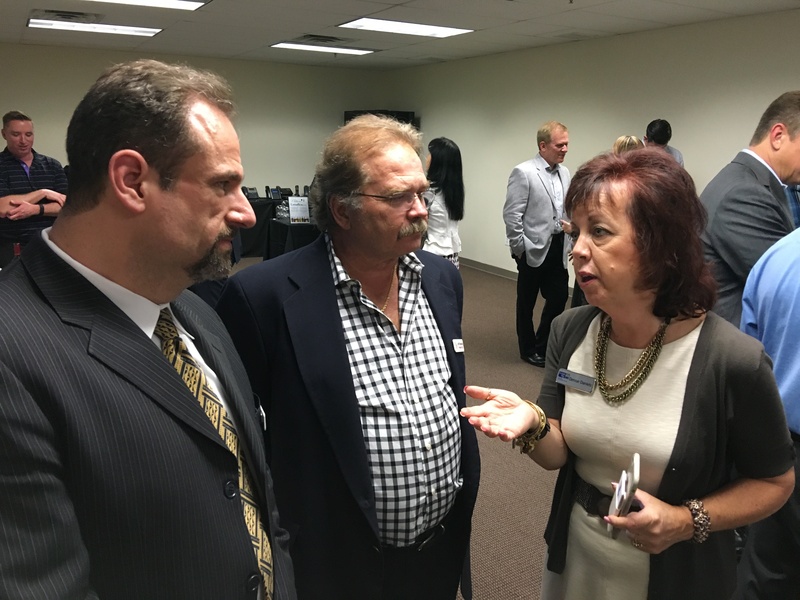 Kenneth Hitchner, director of public relations and social media at CMA, Jeffrey Barnhart, CEO and president of CMA speak with Denise Daniels, director of community outreach and volunteer services at United Way of Greater Mercer County at a wine tasting to benefit Trenton Digital Initiative at Ancero in Mount Laurel. Computers and related equipment are still being accepted at Ancero’s offices, located at 1001 Briggs Road in Mount Laurel. Items can also be dropped off at the MIDJersey Chamber of Commerce and the United Way of Greater Mercer County. Ancero’s other strategic partners who graciously donated a variety of fine wines for the event included: MIDJersey Chamber of Commerce, who recently recognized CMA as 2016 Outstanding Small Business of the Year, Layer 8 Security, Chorus Communications, Rethink Innovations, Comcast Business, Limebox Networks, Masergy, JerseyMan-PhillyMan Magazine and West Unified Communications Services. For more information about Creative Marketing Alliance, visit CMAresults.com. Creative Marketing Alliance (CMA) is a responsive, full-service marketing firm that delivers award-winning campaigns, recommendations and return-on-investment (ROI). CMA builds brands from a client-side, value-based perspective. It successfully launches and manages integrated marketing programs using Marketecture™, a strategic analysis process that helps clients understand how their company can be best positioned. Based in Princeton Junction, N.J., for more than 29 years, CMA provides innovative solutions in the areas of traditional design, interactive design, content creation, public relations and strategic marketing with an in-house studio for advertising and creative design. For more information, please visit CMAresults.com, call 800-852-4269 or email us at info@cmasolutions.com.